Senator Fran Pavley (D-Agoura Hills) addresses the media after the passage of S.B. 32 in August. She’s flanked by Assemblymember Eduardo Garcia (D-Coachella), Governor Jerry Brown, and Senate President Pro Tem Kevin De Leon, from left. Image courtesy Fran Pavley’s office. Senator Fran Pavley is one of the members of the California legislature who will, with the end of the 2015-2016 session next week, bring a close to her tenure there. Pavley served for six years in the Assembly and six years in the Senate, where she worked hard to find consensus on environmental and climate change policies. Pavley had a very successful career in the legislature, passing numerous bills on issues ranging from the environment and energy efficiency to education and women’s health. Among her biggest—and most famous—accomplishments is A.B. 32, California’s landmark Global Warming Solutions Act, which created targets for reducing greenhouse gas emissions and set the stage for the state’s cap-and-trade system. She also wrote a followup bill, S.B. 32, which extended those targets beyond the fast-approaching original deadline of 2020. In addition, Pavley headed up a successful fight to win the unprecedented right for California to regulate greenhouse gas emissions from vehicles, and she wrote a bill that could help California finally create a rational, sustainable groundwater management policy. Streetsblog talked with Senator Pavley about some of her accomplishments recently. There was a lot more we could have talked about, but we had to cut the conversation short so she could deliver a speech. The conversation below has been edited for length. “Right now we have too many basins where whoever can drill the deepest well gets the water. People literally—especially small farmers or lower income people—have been left high and dry, with the state of California providing huge containers of water, trucking them to their homes. It’s just amazing,” she said. The extreme conditions meant that people were more than willing to talk about solutions, and she was able to pass a bill that requires severely overdrafted basins to create a plan to manage their groundwater. “That means some kind of adjudicatory process to determine what is each property owner’s underlying fair share of groundwater,” which could give rise to a more rational way of working out water ownership in the state than the historical first-come-first-served approach. California has set itself up to be a model in many ways for the rest of the country and the world. With A.B. 32, and now S.B. 32, Pavley and the legislature have created flexible climate change policies that are achieving emission reduction goals, producing revenue that contributes to other state goals while reducing greenhouse gas emissions, creating jobs, encouraging innovation, and creating a forum for an ongoing public discussion of how best to tackle climate change. 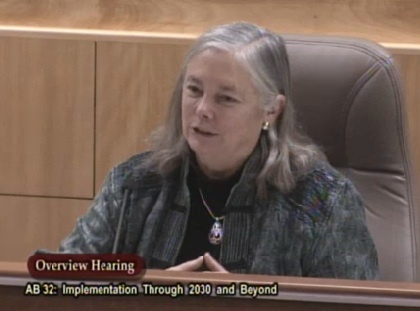 Senator Fran Pavley testifies at a hearing on the future of A.B. 32 in 2014. “Until you were able to really scrutinize how cap and trade would work, and look at some of the challenges that faced Europe to be successful, it seemed to me we needed to spend some time really studying that. CARB did so, holding a lot of stakeholder meetings about how to move forward.” Those stakeholder meetings are ongoing, and continue to raise questions about how best to meet the goals. Is cap-and-trade the best way forward? Is it enough, given the challenges facing California and the world? Will clean cars be enough? Can Californians just keep on driving in solo vehicles, and still meet climate goals? “Electric cars are just one of many solutions. Transit is number one,” said Pavley. She talked about L.A.’s recent passage of Measure M, which will greatly expand transit, “but we’re barely keeping up with the growing population. That’s part of the challenge. The other challenge we’ve always had in Los Angeles is that we were allowed to grow with no urban design to it. And trying to purchase property under eminent domain to put in transit lines is extremely expensive and controversial.” The challenge is how to maximize the existing right-of-ways for all users. Because California had already started to regulate smog in the 1960s, state rules predated the federal Clean Air Act. That means that California is the only state that can pass more stringent tailpipe emission standards than the federal government—although other states are allowed to adopt California standards if they wish. Which raises the question of what will happen under the incoming administration. Senator Pavley will be succeeded by Senator-elect Henry Stern, her Senior Policy Advisor for years. Stern worked on energy and climate issues in the Senate and in the private sector.